My main quibble about Veloce’s earlier books (and most scooter books) is that they lack focus in the interest of covering too much and appealing to everyone. By contrast, the Essential Buyer’s Guide is beautifully narrow in scope, focusing squarely on a pre-purchase inspection of classic 2-stroke Vespas. It’s organized well, illustrated precisely with useful photographs, and written clearly. 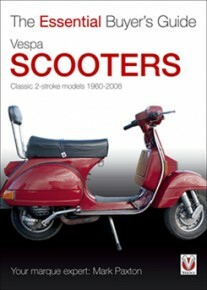 It covers a wide range of Vespa models, and if the reader ignores a few specifics, most of the information can be applied to Lambrettas and other vintage scooters. There’s no boilerplate “history” section rehashed for the thousandth time, and no space wasted on anything unrelated to the inspection process. Each point is explained to the perfect level of detail. A few bits are Anglo-specific (especially the “Paperwork” section), but can give an American some useful perspective. The author’s “points” system for assessing a scooter is a bit overly ambitious, but it still makes a very useful checklist. Prices are generally comparative (“Model X” is worth more than “Model Y,” “Upgrade A” is expensive compared to “Repair B”) rather than specific, which is a useful and inflation-proof system. In short, this is a book full of information that most scooter fans have learned the hard way. It’s great to have it all in one place, it’ll keep any scooter hunter’s head straight through the exciting and often irrational scooter-buying process. Any veteran scooterist has answered these questions hundreds of times online, but never took the time to compile them so artfully. Paxton covers it all, and he’s careful to explain how complicated and expensive restoration can me, he (perhaps too politely) points out the hallmarks and dangers of poorly-done Asian restorations, and he gives an honest overview of what to expect regarding reliability, maintenance, and parts availability of vintage scooters. This book would make a great gift for vintage-scooter-curious friends and relatives, and it’s a useful addition to any scooterist’s library. It’s arguably the most useful scooter volume Veloce has published, hopefully they continue in this direction, perhaps with a similar Lambretta book, and other specific and technical scooter books, it’d be great to see an improvement on the dated and sometimes-vague Haynes manual for vintage Vespas.